It is the state of superconsciousness, and includes both consciousness and unconsciousness. The man who attains that state has all that we call knowledge. Man’s search for knowledge has spanned millennia. It has included within its scope the mysteries of nature, the occult, human behavior, the workings of the human body, the far-off universe and much else. This search for knowledge has paralleled the evolution of mankind – not just in biological terms but also in social and psychological terms – over the centuries. The question we ask is, where does this search end? Or does this search for knowledge ever end? Does mankind have the possibility of ‘knowing everything’? 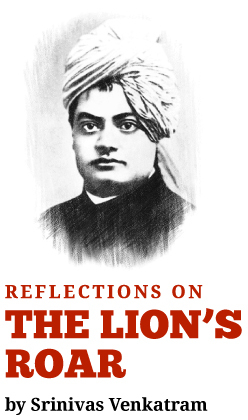 Swami Vivekananda answers this challenging question through this statement above. The instrument of knowledge is the human mind, and its capacity to perceive knowledge depends upon the knowledge state of the human mind. Each human being has access to multiple ‘knowledge states’ or ‘states of mind’ as much as different human beings have access to some ‘knowledge states’ or ‘states of mind’ which others don’t. In modern language, we attempt to describe this notion through multiple ‘intelligences’ such as mathematical intelligence, musical intelligence, etc. These descriptions, though limited, acknowledge that states of the human mind give us access to different zones of knowledge, access to different aspects or dimensions of Reality or different visions of a Unified Reality. These ‘states of knowledge’ lead to conscious, para-conscious, or even unconscious knowledge or understanding of the world. Swami Vivekananda, draws our attention to a higher ‘state of mind’ or knowledge state which he calls the state of superconsiousness. This state of superconsciousness is a state that transcends the difference between articulatable and intuitive knowledge, between the conscious and unconscious, and takes us one step further. It gives us access to an even deeper vision of reality that explains and yet goes beyond both our conscious and unconscious glimpses of reality. This ‘state of mind’ or ‘knowledge state’ is one where we, as human beings, gain access to a much vaster, far more comprehensive vision of Reality that transcends, but does not negate all our conscious knowledge of the universe, and furthermore accepts, integrates, and harmonizes our deeper ‘unconscious’ or intuitive knowledge of reality into an integrated whole. Individuals who are able to access this state are thus able to gain a comprehensive vision of Reality – thereby realizing the goal that mankind has sought and strived for through the ages. We can arrive at the same conclusion by looking not at the mind as an instrument of knowledge, but by examining the nature/ form of knowledge. Knowledge as seen in the world around us is data – either physical or sensory data, or data about human beings or social situations, or even data generated from our every engagement with reality. All these forms of data are not recorded in the same way. Some forms of data are recorded as explicitated descriptions of the external world – subject to different classifications, and conceptual and other mental categories. Some other forms of data, for example human data, may be stored in the forms of patterns in the mind, morphologies or clusters, taxonomies of potential responses, protocols for behavior and engagement, etc. Some of these are articulatable and some of them may yield answers through an unconscious or rapid para-conscious processing of the inputs from the environment. This much is known and understood widely. What Swami Vivekananda adds to this is the ‘principle of generalization’. The principle of generalization has been seen in science when scientists search for a more generalized theory that explains reality. Swami Vivekananda states that this generalization can be applied to knowledge in all its forms. Knowledge carries within itself the unique ability to be abstracted or generalized to higher and higher orders of abstraction or generalization. This is the deeper view of knowledge. As we dive deeper into knowledge, we discover deeper ‘orders or layers of knowledge’ – each order or layer of knowledge being able to explain fully all the lower or more shallow layers of knowledge. Furthermore, as we dive deeper into any knowledge we come face to face with a deeper integration of one body of knowledge with another body of knowledge. This is because the more general a description is, the more aspects of our reality it can encompass in its description. As we continue this journey, we will come face to face with an integrated vision or description of reality that is capable of explaining and including within itself all the orders of knowledge we have traversed in order to reach this state. Implicit in this description is the Indian idea that the reality outside us may be diverse, complex and ever changing, but the descriptions or ‘knowledge of that reality’ are being stored in the human mind. Therefore, by diving deep into the knowledge within the human mind, one can gain access to deeper and deeper orders of knowledge about the reality outside us. Thus, when we reach the most general order of knowledge within ourselves, we have automatically gained the capacity to access an equally deep and equally general description of the reality outside that can potentially express or describe Reality wholly, in its most generalized form. This is described as the state of superconscious knowledge, attaining which state, a man has all that we call knowledge. Next Next post: Is the universe objective or subjective?